One of the biggest benefits Chelsea have enjoyed from their switch to 3-4-3 is a more stable and efficient build-up. This allows them to enter the final 3rd more consistently and in better positions creating a platform for the front 3 to combine. It followed, therefore, that one of the keys to the game for the home side would be to prevent Chelsea from building up in clean fashion. Guardiola’s plan to do so came in the form of an aggressively man-oriented press from a 5-2-3/5-2-2-1 base structure. 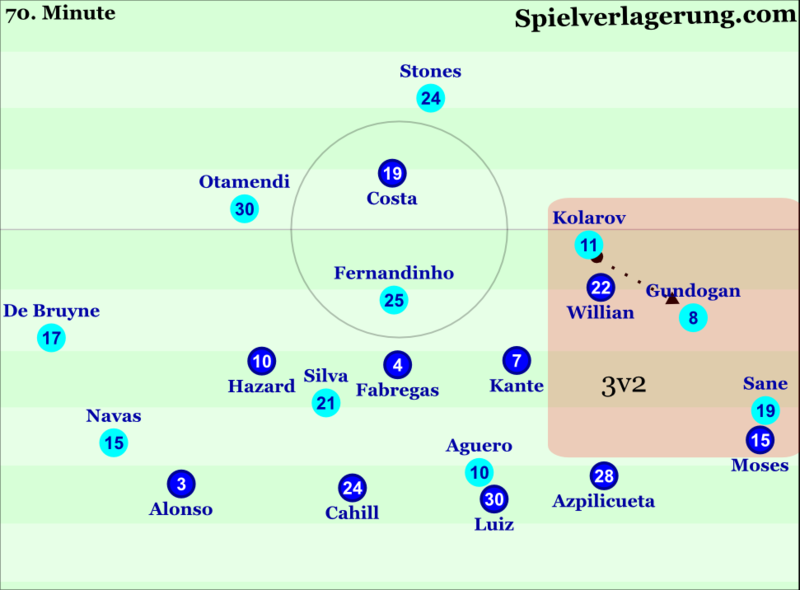 The base 5-2-3 shape gave Guardiola’s men a very clear reference point with each player having a clear assigned opponent. The front 3 gave City immediate access to prevent Chelsea progressing in the centre or half spaces. The two closest Chelsea centre backs to the ball would be subjected to the most tightest pressure from City’s closest two forwards. The role of Aguero in preventing passes to Luiz was particularly key since the Brazilian is often used as an escape route to to switch the ball across. The danger with following Luiz deep is the increased space that movement could create in midfield, and Chelsea’s side backs are often able to use their midfield pair to switch the ball across when an opposition forward attempts to block Luiz. However, with their intensely man-oriented coverage City aimed to prevent Fabregas and Kante from turning out to make an effective switch. City’s pressing was naturally mixed with an element of ball-orientation as the ball-far players would shift across to cover the centre, and accepting larger distances to their opponents in the process. Whilst City’s ball-near 6 would mark their opponent tightly, the ball-far one would sit deeper and allow the ball-far 10 to shuffle across and man-mark Chelsea’s other central midfielder. The same was evident in the defensive line where City’s ball-near wing-back and side back would aggressively man-mark whilst the remaining back 3 would cover deeper positions. This was vital for retaining an element of stability in the event of Chelsea beating the press. This is why the ability to prevent switches in Chelsea’s build-up was so important. If switches were allowed; the long distances would mean time on the ball and City would be forced to retreat. Furthermore, keeping Chelsea’s play on one side would lead to more predictability and with their intense approach the Citizens would have more chance of winning possession. There were a number of occasions where a couple of factors allowed Chelsea to escape City’s pressure and play to the far side. One such situation where this occurred was after turnovers. After losing the ball it inevitably took City players a certain time frame to organise their coverage. Chelsea were at times able to use this to their advantage and create small overloads near the ball to find a free man who could switch the ball away from the home side’s pressure. However, the home side’s pressing was largely effective and generally prevented Chelsea from building consistent attacks from deep. As part of their formation change; Chelsea have been defending in a 5-4-1 shape. One particular benefit the Londoners have encountered has been greater width in the last line of defence. This provides them with stability against wide attacks whilst allowing Pedro and Hazard to aid the compactness in midfield. 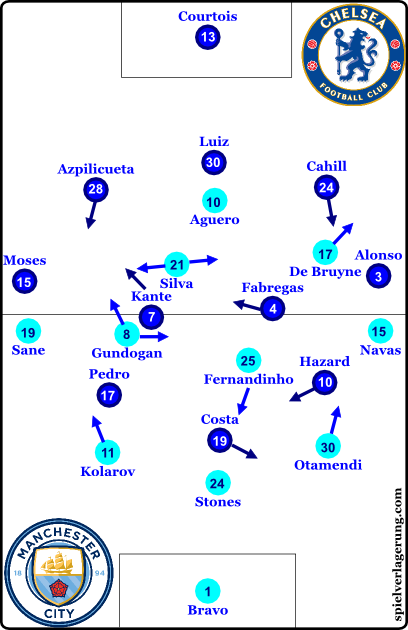 With Conte’s side operating in such a distinctive system; City’s adaptations to play against it were clear. City’s attacking game was based very much around wide areas as they targeted brief “2v1” situations. To facilitate this wide attacking strategy, City’s ball-near 10 was often positioned on the outside of Chelsea’s midfield four. The ball-far 10 would move and occupy a central position behind Chelsea’s midfield line. Along with Aguero, this was key in forcing the opposing midfield four to block the centre, in turn creating extra space out wide. Another key was the positioning of the Sane and Navas, their presence was enough to occupy Chelsea’s wing-backs meaning City’s wide 10 could have time on the ball to cross. Alternately they could play Sane or Navas towards the byline if Chelsea’s wing-back pushed forward to close De Bruyne/Silva down. These situations were often created after switches. With Hazard and Pedro playing narrow to cover the centre they often had large distances to make up after switches, this naturally meant City’s recipient enjoyed longer time on the ball. This was often utilised by a side back dribbling forwards or Gundogan moving wide to receive the ball on the left side. When they created these 2v1 situations City often tried to enter the box with low and/or early crosses. These were often aimed towards diagonal runners towards the far-post. However it also created passing options back into central areas with the long shifts Chelsea’s midfield were forced into creating windows of opportunity to penetrate them. With City taking the lead just before the interval the onus was on the away team to find an equaliser. The Mancunian side were therefore able to create a number of threatening opportunities on the break two of which fell to De Bruyne, both were somehow missed. However there were a number of issues in City’s game that were becoming apparent. One of these was their declining intensity against the ball, allowing Chelsea to build attacks with more regularity. Another was their increasing vulnerability to counter attacks with their counterpressing becoming gradually worse and their presence in defence being inconsistent. These issues would eventually come back to haunt the home side. From Chelsea’s point of view the introduction of Willian was vital. With the Brazilian winger replacing Pedro Chelsea benefitted from his superior speed and ability to cover large distances with his dribbling, this facilitated their threat from transitions. Chelsea were able to gain a greater foothold in the game through a number of natural causes resulting from the game state. Being a goal down Conte’s side naturally placed more emphasis on high pressing which they did with a similarly man-oriented coverage. This often worked to destabilise City and lead to quicker turnovers, although City did find some joy escaping this pressure with the wide movements from their central players. 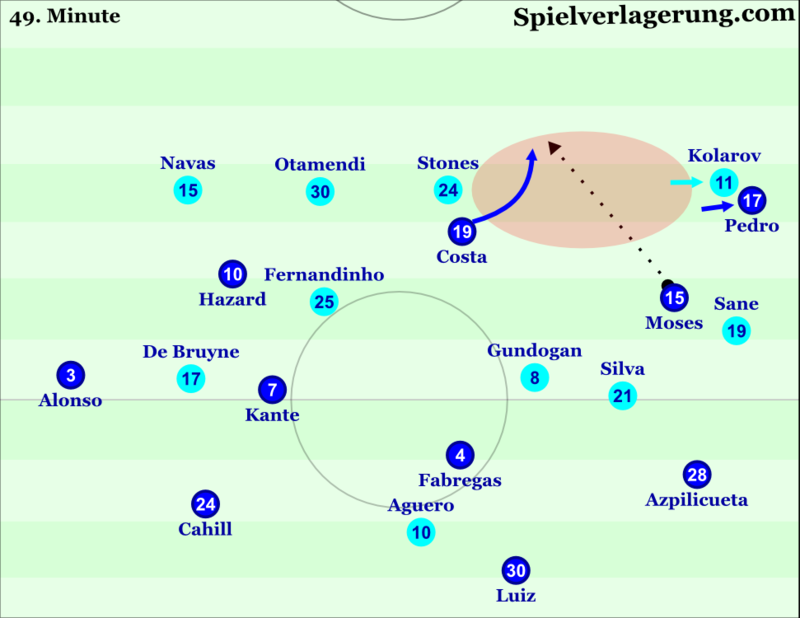 In possession Chelsea benefitted somewhat from the Citizens’ declining intensity in pressing. However, a major improvement in Chelsea’s game was the movement of the forward players, this was vital in allowing Chelsea to progress. By dropping towards the ball they could create enough separation from their opponents to receive the ball, with the advantage of starting their movement earlier working in their favour. At times the movement of Hazard/Pedro was key to creating openings in City’s rearguard. By moving wide or deep they could drag Otamendi or Kolarov out of position leaving large gaps for Costa to run through. 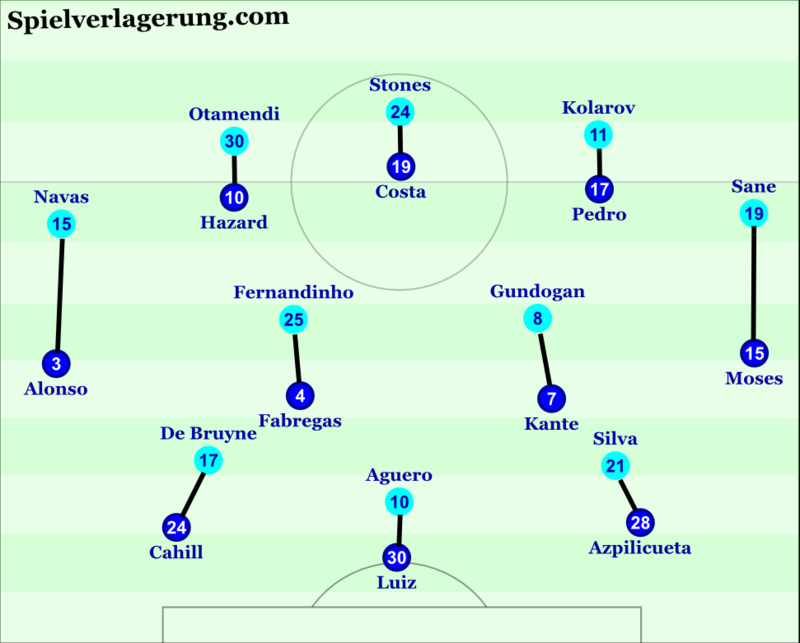 After equalising, with Fabregas taking advantage of the time he was given on the ball to play Costa in, Chelsea’s threat on the counter attack was set to become an even more prominent feature with City looking to restore their lead. Chelsea were now able to retreat into their 5-4-1 defensive block. However they still experienced some issues with City’s advancing side backs, wide midfielders and wing-backs creating 3v2 situations in the half spaces and wings. With these advantages City threatened to regain the lead as they were able to make dangerous entries into the box through the half spaces. However their offensive shape gradually became looser which made them vulnerable to Chelsea’s counter attacks. An additional point is City’s sub-optimal reactions to losing the ball, they thus struggled to close Chelsea’s exit routes. Chelsea’s counter attacks were put together in devastating fashion. The ability to beat opponents approaching from behind was vital and the speed of Hazard, Costa and Willian allowed them to take advantage of the space behind City’s defensive line. City’s desperation was gradually increasing, this combined with Stones being replaced by Iheanacho meant it was little surprise when Chelsea took a 3-1 lead with a through ball from Alonso to Hazard essentially sealing the 3 points. Conte’s side earned a crucial victory against arguably their main rivals for the title. Although they were somewhat fortunate to be only 1 goal behind their devastating counter attacks ensured they took full advantage. Chelsea have now come through a tough run of fixtures with 8 consecutive victories including wins over United, Spurs and Everton. Their form appears to be imperious and if they are to maintain this level Conte could well be celebrating a Premier League title in his debut season. 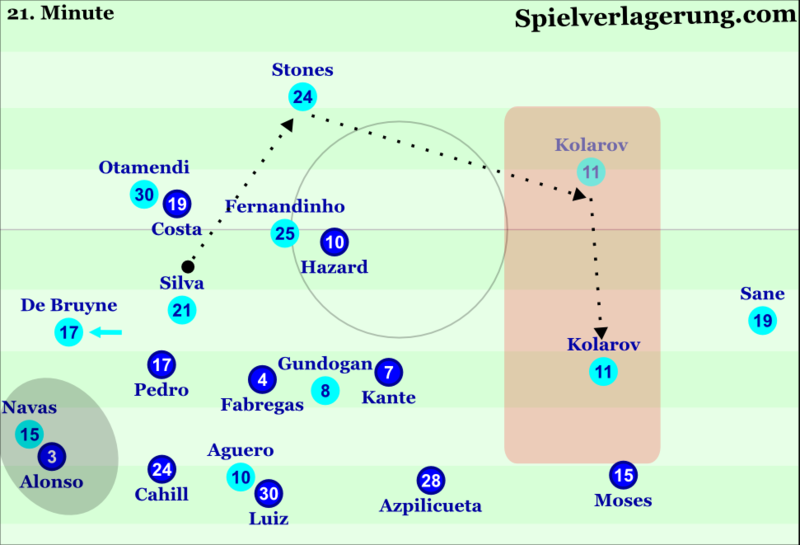 Guardiola’s side were somewhat unfortunate with a number of expected goals models indicating they had enough chances to be comfortably ahead by the time Chelsea equalised. 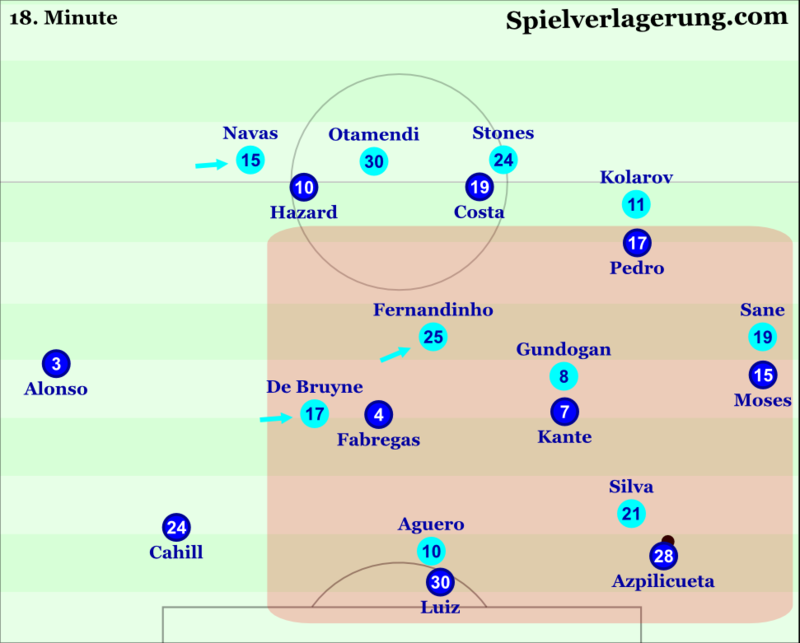 The wide positioning of the likes of Silva, De Bruyne and Gundogan created some issues for Chelsea and they were able to create openings from this. Perhaps the bigger problem to come from this game is the suspensions Aguero and Fernandinho will face, missing the crucial fixture against Arsenal. Another superb analysis JD; enjoyed it very much.I must admit I just couldn’t stop myself from saying a few things that I genuinely felt after watching this game ( 7 times in total ) . So here it is ; IMO if you don’t take your chances ( and may I add clear chances at that !!! ) then that’s your fault; it’s not unfortunate or unlucky or anything of that sort. I also feel in terms of physical stamina this man city team is not good enough to continue intense and relentless pressing for full 90 minutes. It’s also very obvious that every single city defender in this team is just not good enough when it comes to individual defending . In addition city’s collective defending in organized defensive phase is just about average.The last thing that I would like to say is that Pep Guardiola just haven’t managed to strike the right balance between defensive security and offensive creativity something that Conte has done masterfully in a very short time.Thank you ; God bless you and your family!!! Hello. I do not agree with that. Being a coach/manager/analyst you should never analyze event and make a conclusion based on one occurence. You should know the reason why such event (missing a big opportunity) happened and make estimations. You should think about creating events (opportunities) where you are very likely to score. And City did it. 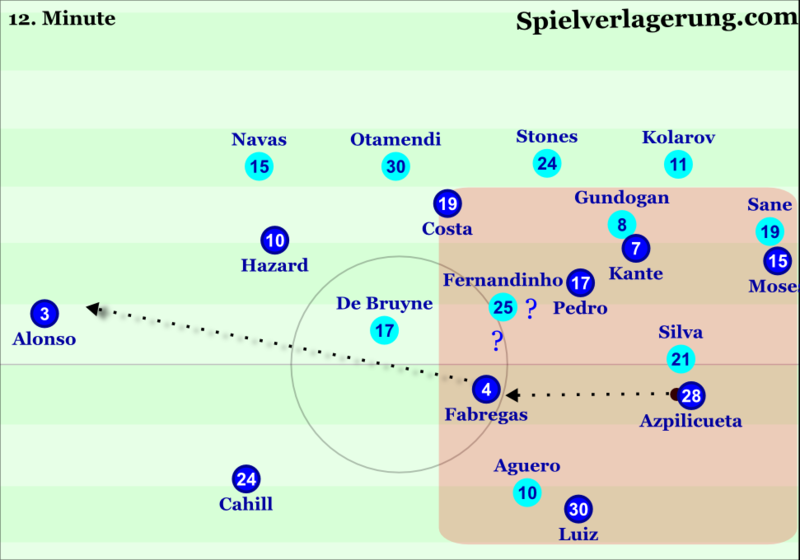 I look at it differently – from a probability point of view: how many times is DeBruyne going to miss such a chance? Lets be honest, not many times. I will not dig into mathematics now, but in many many cases De Bruyne is going to score, you will take a lead 2:0 and you will probably win. I, as a manager, would be very happy with City performance, because we managed to create big big chances that would give us a lead for 2:0. And that is what matters in the long run. Of course there comes the ability of manager how he handles the situation in locker room if many unlucky things occur. There are so many opinions and biased analysis (this one is not) that is consequence of few lucky/unlucky events or simply by result. Just look at a Mourihno example against West Ham. I read an article how he proved to be genius with substitutions. United had almost no chances while Antonio had a chance going 1vs1 with goalie. If he would score, we would say Mu is rubbish, no matter what kind of substitutions he would make. Hello, I had a question: you described Guardiola’s intention to target the wide areas to make the most out of occasionals 2v1 on the wing. You described Silva’s and Aguero’s key positioning in the process. Could you please explain why was it key? Was could not Pedro step out to close down De Bruyne? Yes, he could in theory, however I think there were two main things that meant De Bruyne had time & space. After switches, it would take Hazard/Pedro a little period of time to make up the distance and close him down. Secondly if they Chelsea used on the midfield players out wide to press it could have opened space and routes to the inside of the block for the likes of Silva/Aguero, so they were needed to defend inside spaces. nice article JD! can you please tell me which tool do you use for the pictures, thanks. Thank you, we use a programme called Inkscape.